Don’t Play With Your Food. But Think About It, Do. – Eat Me. Drink Me. Don’t Play With Your Food. But Think About It, Do. A scene from this year’s Easter fête: all of us, except mom, standing over two racks of lamb, discussing raw meat’s lack of visual appeal. Gross, disturbing, almost human-looking. An actual carcass. Mom was busy bleating in the background, “You killed my baby. I’m going to come get youuuuuu….” She refused to come any closer and did not participate in the subsequent lamb-eating, to be sure. But the rest of us were fascinated by the lamb. It was covered in filmy plasma from the fleshy strip of base up through the gangling, sawed-off ribs knocking against each other, and it gave off an earthy smell, like blood and dirt. Horrible, raw, food for Hannibal. The cooked lamb was benign. Delicious to be sure, buttery soft and pink near the bone, tasting of rosemary and mustard on its crisp, fat-browned crust. Less like dead baby lamb and more like dinner. Perfect, delicious, dead, baby lamb. What a contrast with the raw lamb, which made even a meat eater like me uncomfortable. The feel against my fingers of placental slime, the bones’ raw clack, the way it looked like the ribs ripped out from a child’s back. How ridiculous, I thought. A flow of emotion held captive in my hip? 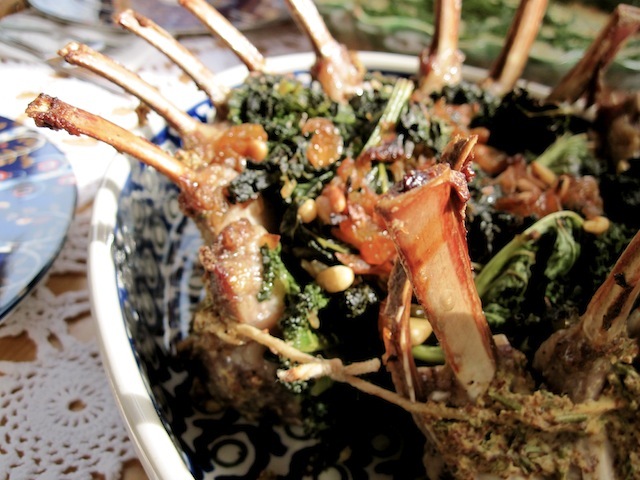 And then I made a rack of lamb and realized that some stretches take us places we’d rather not go and unless we breathe, we’ll never understand where we were. My first response to the gnawing discomfort was to play with my food. 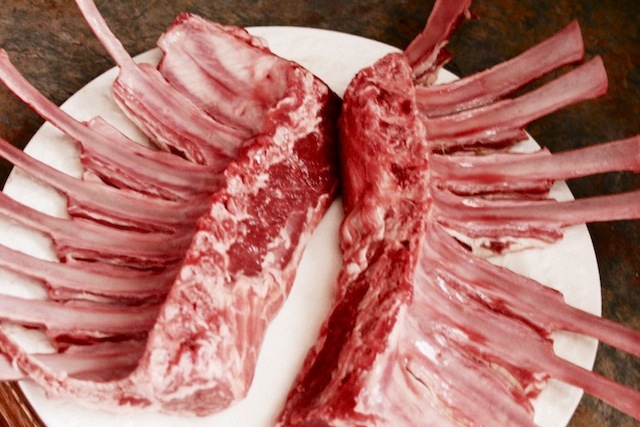 Like the monster in Pan’s Labyrinth, I gripped each bloody rack with my fingers and manipulated the meat to wiggle my new, bony fingers in front of my face. The shriek of horror from my mother almost made the experiment worth it, but it felt wrong. Sacrilegious to the dead lamb to use its body that way. I am not squeamish and I don’t have the emotional constitution of a vegetarian. But I’m rarely confronted with food that makes me so uncomfortable. A few other times: frog legs on a cruise – the way I could make them hop across my plate, those legs suddenly unappetizing; escargot in Paris, a single grain of sand reminding me of a snail’s slow, slimy journey over earth; pig ears from a Brooklyn bodega, the unexpected way cartilage dented under teeth as if a real ear had been too deeply nibbled, a heady smear of gelatin on my tongue; scallops, always. It could be texture or taste, though a scallop is not an ear is not a frog. Besides, I don’t much like the taste of celery, but it never makes me squirm. And I love the salty, melting softness of a snail, the tender, sweet meat from a frog. Maybe some food is too real. It is too much like a separate self, a thing that once had a soul. Does a scallop have a soul? I think part of the problem is that we never really think about our food – where it comes from, what it was, what it reminds us of that makes us uncomfortable. Back to yoga’s lesson, back to breathing. 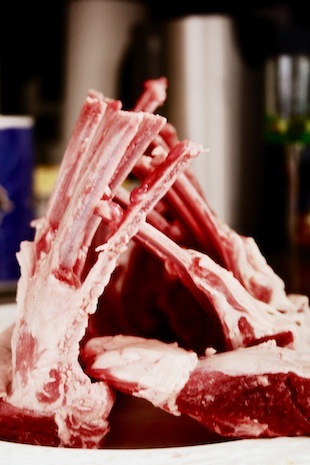 I put the lamb down and threaded kitchen string between each bone until a rough crown stood up on the plate. I smelled the blood and herbs, the grass and flesh. And like a mantra, I breathed, I am going to eat this lamb. This delicious lamb. If it had a soul, I made my peace with it. Preparing it not like just a slab of meat, but an animal whose death meant my dinner. And my uneasiness faded as I stuffed a sauté of kale, pine nuts, and golden raisins into the crown’s empty center. I’ve always treated vegetables with respect – they are magical to me in all their combinations of sweet, bitter, fresh, warm, or salty flavor punches. I somehow missed the memo that meat deserves that respect as well. Perhaps even more so than a vegetable, which will never look at you with big, brown eyes. I grew up down the street from cows. I know all about their big, brown, eyes, intelligent and condemning. I still love beef. So the moral is not this: don’t eat something with a soul. Because first of all, does a scallop have a soul? And second, if a scallop has a soul, there’s nothing wrong with eating other people, assuming people have souls too – because is one soul better than another? Maybe the moral is: love the food you eat, know that you live from other life (a carrot was also once alive), and thank it. Ok, I know, let’s sing a round of Kumbayah and hold hands. But really, I find myself often putting no more thought into my food than: this is delicious or this will taste good with that. But our food deserves more. Because just in case a scallop really does have a soul, I’d want that soul to be consumed feeling like it was, at least, loved. When those tender, perfect, oven-kissed shanks were on my plate, I almost forgot about the pain, the need to breathe when the meat was raw and real in my hands. So what is my moral dilemma, really? Maybe some foods just make me uncomfortable. I don’t know. 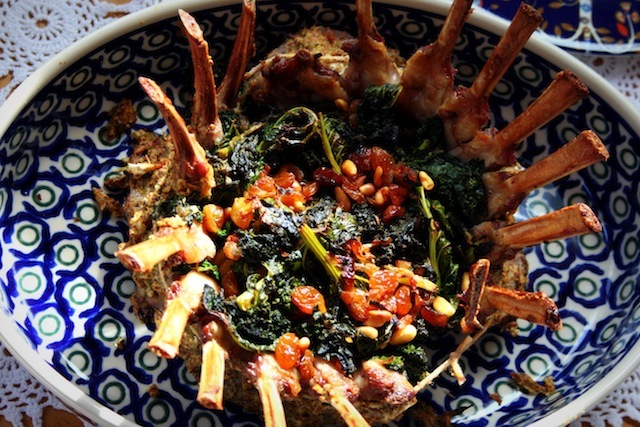 But the lamb – it was so good. 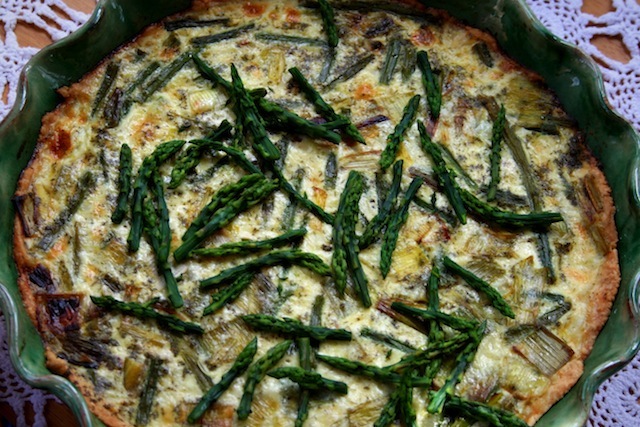 There was much less trauma involved in the asparagus tart, and that was pretty delicious too.